Hank is the proud owner of three precious steak bones and protects his fortune, burying them in Sally May’s garden. He meets Dog Pound Ralph. Returns to the garden... The bones are gone! He finds an empty Vienna sausage can in each hole. 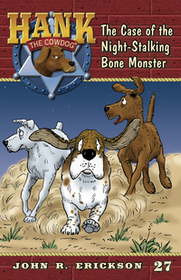 A night-stalking bone monster is loose on the ranch!